Teenage farm-boy Eragon lived a normal life in his homeland Carvahall until one day that changed it all. Eragon was out hunting for food since his family did not have a lot of money. In the valley, it was a normal sunny day, until eragon found an unusual blue stone. Later he would find out that the giant blue stone was a dragon egg, and he was one of the last protectors of the land known as the dragon riders. With help from Brom, a friend from his homeland, he will help train the dragon named Sapphire. Together they must escape the wrath of the empire, urgals and the Ra’zac, a deadly group of hunters. They venture forth through his country, Alagaesia, to the Varden, the old dragon trainers, and the only ones who can train and protect him for the adventures that will come. Will Eragon fall against the dragon killers, or fulfill his destiny as a rider? 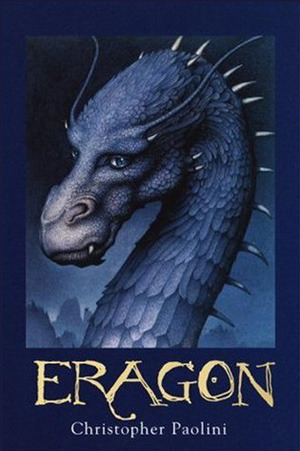 Eragon is the first book in the intriguing Christopher Paolini series. People who love adventure and mythical novels will enjoy this book. The adventurous story of eragon will astonish you with its conflicts and journeys through Alagaesia. I loved this book and its mesmerizing details of the characters, battles, journeys and amazing descriptions of the characters. One thing I did not like about the book was it didn’t explain enough about Eragon’s mother and father and why they abandoned him and how is uncle took him in. I highly recommend this book for anyone who enjoys an exciting story with its amazing plot and danger.